There is probably nothing more exciting to a Zwifter than the release of a new world (maybe an increase in FTP). Zwift currently has five ‘worlds’: Watopia, London, Richmond, Innsbruck and NYC. The most recent course-release, NYC, is the Zwift team’s version of the city 100 years from present day. It is likely that Zwift will release a new world in the next few months – What could it be? Maybe a replica of the Classics, featuring cobbled sectors and roads from the likes of Paris-Roubaix, Kuurne-Brussels-Kuurne, Strade Bianche and Amstel Gold. 2. Maybe a mix of some famous Grand-Tour climbs, such as Alpe d’Huez, Mont Ventoux, Stelvio Pass or the Col du Tourmalet! 3. Or maybe a mix of two different climates/terrain. One part of a world may consist of lots of forests, mountains and lakes, a bit like the Tour de Suisse or Tour of Austria, whilst the other part may be sandy, dry and flat with a scene similar to that of the Dubai Tour and the Tour of Oman. The launch of the Tacx Magnum in 2016 has sparked interest and excitement amongst cyclists and runners, for a number of reasons. The impressive belt-design can simulate gradients of up to 15% (plenty if you ask me) and comes with ANT+ FE-C and Bluetooth Smart to connect to your devices to run applications like Zwift on its 32″ screen. According to BikeRadar, if you push too far forward it will gently increase the resistance to put you back in the correct place on the rolling belt, and if you fall backwards it will decrease to allow you to accelerate — and if you stop suddenly or brake, the Magnum reacts in a split second to prevent you from falling. This would be very impressive – a velodrome with an athletics track inside that can cater for both runners and cyclists in Zwift! We don’t all have the luxury of being close to a velodrome, yet alone being able to use the velodrome whenever we want. The same applies to an athletics track for runners. With the advent of Zwift running, Zwift could build a velodrome, whether it be indoor or outdoor, complete with an athletics track to maintain interest with current users whilst attracting new customers. Organised track races could take place as frequently as current races do in-game, and would offer a different kind of racing. Imagine a scene where riders are storming around a velodrome, complete with a packed-out crowd and an electrifying atmosphere – Basically the Six Days of Ghent (with an athletics track inside)! The racing at the Six Days of Ghent looks incredible. Quibell Park, Scunthorpe, is an example of a velodrome with an in-built athletics track. We are always looking to upgrade our ‘pain cave’. Whether it be a bigger TV screen to Zwift with or a brand new smart trainer, there is a never-ending list of desired training equipment. 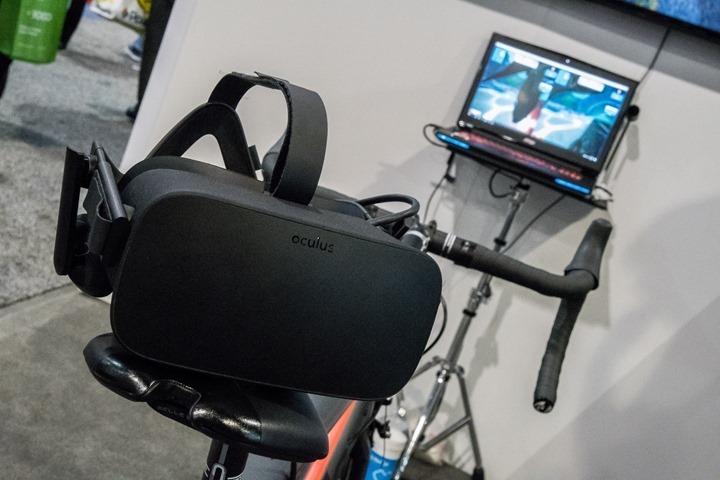 The arrival of virtual reality (VR) headsets into the world of Zwift is an exciting and enticing prospect! Image credits to DC Rainmaker. Headsets such as the Oculus Rift would bring the user one-step-closer to realism, as he/she is able to ride in a 360° virtual world; no different to real-life. Being able to swivel your head around and take in the landscape, road and riders surrounding you would be awesome to say the least. Modifications would probably need to be made to headsets to improve ventilation and cooling whilst exercising, although I would not be surprised to see VR-headsets purposefully built for virtual sports in a couple of years to come. Attaching sensors to your body that reflect your position on the bike in-real-life (IRL), in-game, would be a step closer to reality within Zwift. Body sensors could measure body temperature and hydration, helping you to better fuel yourself before and during a ride or race. The user could, in their own home, test out different positions and balance power with aerodynamics to achieve the optimal position on the bike. I would imagine the body sensors as being an optional feature. However, this could all be prevented! Auto-saving an activity every 10 seconds or so (for example) will help users a great deal when it comes to upload a ride on Zwift manually, because Zwift has completely frozen or other circumstances e.g. your computer has ran-out of battery. Your distance, elevation, average speed, power, heart rate, etc, should all be preserved per autosave. That new world is just around the corner I can feel it! Alpe d’Huez is coming already – woohoo! I wonder how or if they’ll manage the descent though, as the road is a dead end: it’s a mountaintop finish, not a pass. Can’t wait to find out. Rowing might be an activity that would be fairly easy to add, and useful for those who have rowing machines. You could simulate sculling–single rower in a small boat–or perhaps figure out how to coordinate the rowers to form crews. Chris some excellent thoughts there. I tried the 3D virtual reality set up at the Zwift TACX Magnum launch event at Sigma Sports in London. I could swear I was actually going round corners despite knowing I wasn’t. What was missing there was the leaning effect brought in by rocker plates – have you tried them? Thanks Guzzibear. I haven’t personally tried them. Have you? If so, what is your experience with them?